In order to study the hypothetical effects of expanding Medicaid, Mariacristina De Nardi, Eric French, and John Bailey Jones (DFJ) have written a fairly detailed model to study household saving and dissaving (see previous post). To make that possible, they constructed a novel measure of “lifetime income” to make this analysis and make some interesting discoveries about household wealth, savings, and nursing home usage patterns along the way. 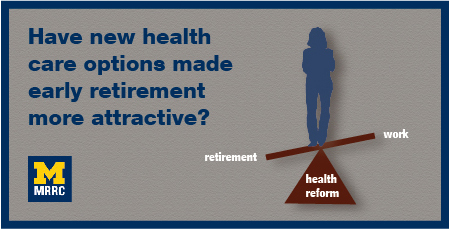 Data from the Health and Retirement Survey and Medicare Current Beneficiary Survey is used in this analysis. Households are analyzed separately by singles or couples. Unsurprisingly, couples are wealthier than singles. The couples in the lowest wealth quintile begin retirement with some assets, while the singles have hardly any. The top quintiles for both singles and couples hold on to wealth into their 90s, while median wealth households spend down some of their wealth during retirement. “Rich people, women, married people, and healthy people live much longer than their poor, male, single, and sick counterparts,” DFJ discover. They find that being female is the strongest predictor of entering a nursing home. Although married people live longer than singles, they are still less likely to enter a nursing home. This is quite a striking result since women typically live longer than men, so one might think that age would be the better predictor. On average, single men and women face, respectively, a 21 percent and 36 percent chance of entering a nursing home, while married men’s and women’s chances are 19 percent and 36 percent. Rich and poor are almost equally likely to end up in a nursing home. Although the wealthy tend to be in better health and are less likely to enter nursing homes at a given age, they also live longer so the effects cancel each other out. On income changes post retirement, couples face a 40 percent drop in income if the husband is first to die, but only 30 percent if the wife is first to die. These drops happen because Social Security’s spousal benefits do not replace the entirety of the spouse’s income. DFJ also find that initially after retirement (before age 80 or so), poor and rich households spend similar amounts on healthcare, but while poorer households do not increase spending dramatically with age (conditional on survival), rich households do. This gap in medical expenditures also translates into a larger drop in wealth upon death of a member for higher income households. Assets drop between $30,000 and $60,000 around the time of an individual’s death. Interestingly, assets experience a large drop when the man dies first in the lowest permanent income quintile, but less when the woman dies first. Simply counting the change in wealth before and after death will underestimate this fall, since a large share of this is in medical expenses leading up to death. When the final member of the household dies, the decline in wealth is even larger, between $70,000 and $110,000. For many households, this means most of their wealth would have dissipated with the last member.